Convent Heights Church along the Peak to Peak Highway in Colorado. 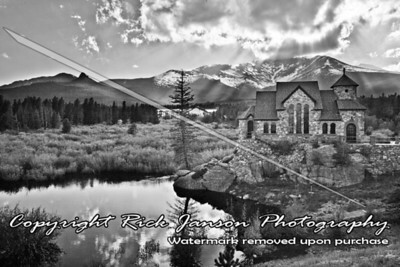 Convent Heights Church along the Peak to Peak Highway in Colorado, with Mount Meeker in the background and late afternoon sun aka "God rays", dramatic black and white, Colorado Peak to Peak Highway. June 10, 2011.